On the stored vegetation tab you will see what is stored in the package. You can select each vegetation item and see the count and the source. The painting tools, baked vegetation and external API all has its own VegetationSourceID and this will show up on the UI. You can clear the storage per source also. Allowing you to rebake from rules while keeping all manually painted vegetation. Loading vegetation from a persistent storage is faster that the run-time spawning but it does not allow you to change vegetation spawn rules run-time. 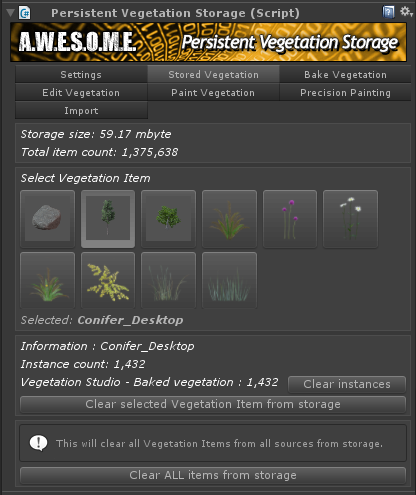 You can also edit the vegetation in the storage with the included tools and API. In this example you can see there is 1.4 million instances of vegetation. The package is 59mbyte.